Have you ever seen those customer testimonials on other websites and thought "That's a good idea, but I would have to keep changing my pages to keep it fresh." Well now you can add customer comments to your website and have them change either randomly with each page refresh or scroll through one at a time without changing the page. As a bonus we also allow you to add a picture to represent the site. A new page in the Administration section of your website allows you to add, delete and modify your Customer Comments with the same ease that you would add, delete or modify any of your products. You can add a comment, a name for the commenter, their website, a picture and the product they're commenting on. A link to the product that's being commented on to help build those all important sales. CPMods' new Customer Comments Mod is just the ticket for showing potential customers just how good your products really are. This is the same mod as we're using on www.cpmods.com, in fact you can see it in action to the right of this text under the heading "Sites using our MODs". Go to the Customer section and look in the Customer Comments page. 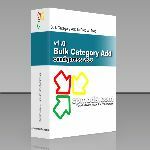 Bulk Category Add to Product.